When a couple gets married, most people take a ton of pictures. You’ll want photos of everything – the people, the newlyweds, their parents, the dressed up dog in the tuxedo, everything. The question is, what exactly are they for and what are you supposed to do with them all? You could do several things with them, once you’ve gotten them all back from the your wedding photographer that you hired to take them. You can put them in a scrapbook, or add them to an album or a set of albums. You can have the really good ones printed up into cards or onto canvas prints for your home, or even something as large scale as a wall mural made from a collage of photos. Anything you do with your wedding photos to display them is a good thing. Scrapbooking is a wonderful thing. All you need is some glue or tape to paste stuff in your books, pretty sheets of durable paper and maybe some cool stickers and labels for your pages. Then you put them in whatever order you like, whether it be chronological or by photograph type. For example, you would put all the dinner photos together, and all the photos of the actual wedding party together, et cetera. If you aren’t crafty or making a scrapbook doesn’t appeal to you, you could simply put them together in a set of matching albums. This is a good way to keep them all together and at hand for someone that wants to see them. If you are interested in keeping your wedding photos on a large scale or perhaps interested in distribution, then you might get some canvas prints from them. Canvas prints are prints of the pictures that are printed onto the same kind of canvas that paintings are done on, and they are a great way to display the pictures that your Philadelphia wedding photographer took on the best day of your life. You can use different websites to do this, and you can order all kinds of things with your wedding pictures on it – coffee mugs, greeting cards and calendars, even blown up acrylic versions of your photo to hang along with your canvas prints. If you are interested in a long term project, take all of your photos that you get from your wedding photographer and make them into a collage . This is where you take your pictures and combine them all together on the same wall. You can have a nice border if you like, and you can use any of the pictures that you like. A great way to start is to get a larger print of the couple and place it in the middle of the wall that you’d like to start your collage on. Then place different parts of the wedding around it in a circle – perhaps you could group the bachelor party pictures and tie them to the pictures of the best man giving the speech. Either way, this is a wonderful way to display the photos, bluntly arranged on the walls for the whole world to see. Whatever wedding photographer you choose to use, ask them what they would do with their pictures in your case. They might be able to give you some ideas and be able to point you in a direction that you would have ordinarily thought of to use your photos. There are so many things that you could do that you might already know, but if you needed some help it wouldn’t be a big deal to ask some one. If you don’t want to display your precious memories, you can get an album and if you don’t want them to collect dust, then you can put them out for the world to see. There are a million ideas for photos that are so easy anyone can do them. 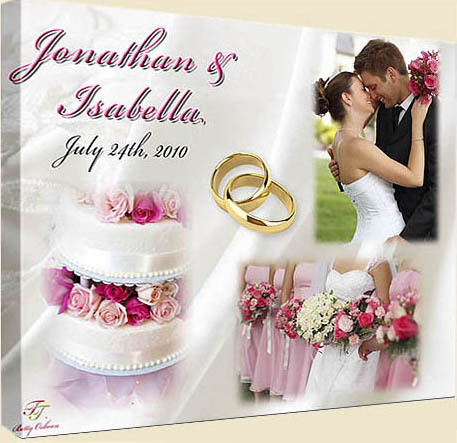 At timeinatreasure.com we offer beautiful wedding and anniversary templates, to create that custom collage. Floral backgrounds, elegant and wedding cake. our wedding canvas wraps are simple and make a unique gift. And our traditional prints are a beautiful way to showcase your special day into one memory. See our galleries for details. For stunning Philadelphia wedding photography, visit http://mainlineweddingphotography.com. David Landes specializes in internet marketing – turning your website from a static online brochure to a successful lead generation tool.